Learn the fundamentals of analytics in a fun way. Large businesses and startups alike are rapidly realising the importance of analytics. Online research will only take you so far – it’s time you learnt from the global experts in analytics training. Have lots of fun using analytics! Basic maths, logic and reasoning skills with a desire to learn more! Ever felt that you’re missing out on the data race? Don’t know the difference between a variable and a vegetable? Then our Analytics for Beginners course is just for you! The motive of the course is to introduce absolute beginners, or novices to the fundamentals of analytics by using examples from daily life. Using a combination of real-life stories, interviews with analytics experts and journalistic articles presented in a breezy narrative style, Analytics for Beginners will ensure that you will never look at numbers and data in the same way again. By understanding how companies like Netflix, Amazon, Facebook or even great individuals like Archimedes or Florence Nightingale used analytics in their chosen spheres of work, the course will convey the relevance and importance of using analysis in everyday life. In terms of prior requirements, the viewer will only need a working knowledge of Excel, with logical and reasoning skills. A basic understanding of regression is also covered in the course. Mathematics skills are not required! Are you a working professional or a stay-at-home mom? A young go-getter or an old has-been? A small business owner or a multi million dollar corporate hi-flier? The point is that none of it matters - because whoever you are and whatever you do, analytics can help you do it better! We’re not going to pretend that you can run logistic regressions and crack warehousing solutions at the end of this course. But what this course can do is open your eyes to the wonderful world of analytics opportunities and introduce you to some of its career possibilities. Do you use a case study? Keeping with the light-hearted tone of the course, the over-arching case study covered is based on the game of cricket. You can read up more about how the game is played, on its Wikipedia entry. The case study seeks to determine who is the best cricketer amongst Indian cricketing greats - Sachin Tendulkar, Rahul Dravid and Saurav Ganguly by using regression analysis. This ensures the overall flavor of the course remains light and fun, even if the analytics does require a little data work. Whoever you are and whatever you do, analytics can help you do it better. This course is for everyone! Jigsaw Academy is a global award-winning online analytics and Big Data training provider, headquartered in Bengaluru, India. 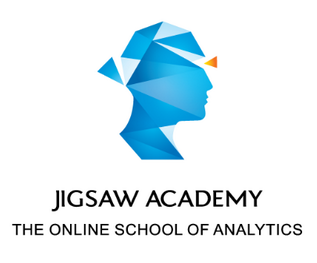 Founded by analytics professionals, Jigsaw Academy has helped over 50,000 students in 30+ countries build a successful career in analytics with their specialized industry-oriented courses. Jigsaw Academy also offers executive academic programs in partnership with University of Chicago Graham School, USA amongst other academic partnerships. It has been consistently ranked #1 as an analytics training school in India over several years.